There is always enough room for promising food businesses like Lembest Lechon. The distinct taste of its roasted chicken has helped mold its own identity in a continuously growing lechon manok market. Find out why it can be considered as a promising business opportunity. <>When someone mentions ‘lechon manok,’ the first thing that usually comes to our mind is celebration. Noticeably, Filipinos love to commemorate special events through preparing and serving sumptuous meals. Native-style roasted chicken has become a staple in almost all special feasts. Paul Sobrepeña, franchise business consultant of Lembest Lechon, shared a historical trivia about lechon manok. “When the Spaniards took over the country, they were the ones who taught us how to cook chicken in this manner,” he said, giving a glimpse into the cultural significance of lechon manok. Eventually, Filipinos have made interesting variations on how the food is prepared. Moreover, lechon manok has become an enduring but evolving legacy that up to this day is opening up opportunities to businesses like Lembest Lechon. The business was founded in November 2009 by an employee-turned-entrepreneur Lembert Benedicto. Since its start, the business has been facing tough competition. As a new entrant into a steadily growing market, it had to implement effective strategies not just for survival but more so for success. “We drew inspiration from Andok’s, Lydia’s, and Baliwag which have been roasting chicken for years. Lydia’s has a popular location in Baclaran, while Andok’s and Baliwag are all over places. Lembest Lechon decided to duplicate the same success while taking a new spin on its product.” Thus, the business created its own special recipe that its loyal and new customers love. Consequently, this has also led to a surge in the number of its franchised stores. Taking his word for it, one can see why buying a Lembest Lechon franchise could be a wise investment strategy for those looking to start a new business. Of course, this doesn’t mean that one should impulsively go for it without assessing the possibilities. Sobrepeña offers advice for anyone looking to potentially own and operate a Lembest Lechon franchised store. “Do research about the location first because you really need to think about it in order to earn. What are the jobs of the potential customers? How much do they earn? Are they willing to pay P189 for roasted chicken?” Through this, he clearly implied the importance of knowing your target market before establishing a business. Lembest Lechon observes standards before giving approval for any franchise application in a chosen location. It assures assistance and guidance to franchisees, even offering to train each new store’s crew for at least two weeks into operations to ensure that high quality of service is upheld. Moreover, franchisees would also be delighted by the fact that Lembest Lechon is offering more than just its signature lechon manok in its menu. For variety, its branches also sell crispy liempo and lechon sisig. Through the years, the business has already proven that it is a lucrative franchise opportunity for entrepreneurs who intend to get into the food franchising business. 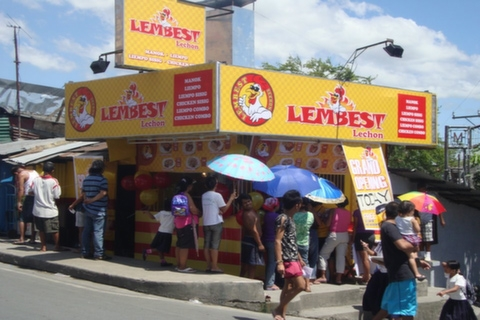 To learn more about Lembest Lechon as a promising franchising opportunity, check out its online directory listing here.